Francesca Rosella of interactive fashion brand CuteCircuit claims advances in digital "smart" fabrics will revolutionise the fashion industry, allowing us to download new styles for our clothes rather than buying new garments. 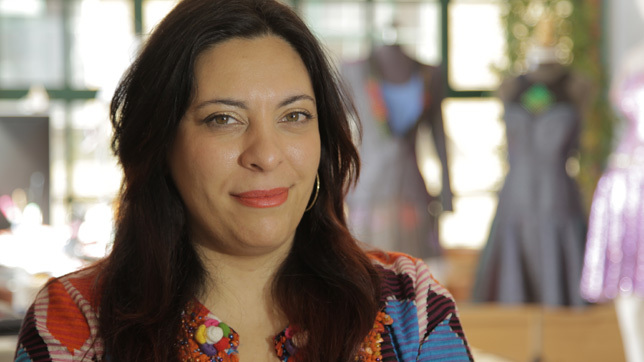 "We are living in a digital future, so we do not need to sell 10,000 skirts," says Rosella. "We could sell 500 skirts, but then could sell thousands of patterns that you download to your skirt." By embedding nanotechnology into fabrics, we can create "smart textiles" that are conductive, or even computational, Rosella explains. "Some fabric that you can imagine 50 years ago was just a stretch knit, now through nanotechnology can be coated with particles of silver or gold to become a conductive fabric, which we can use instead of wires," she says. "There are other fabrics that can do some kind of computation." Thousands of tiny micro LEDs can be woven into such fabrics to create garments that can change pattern or colour instantly. "All of a sudden, these surfaces that you're wearing, these textiles, become alive," says Rosella. "They allow you to express yourself, suiting your mood and the situation you're in with your friends." 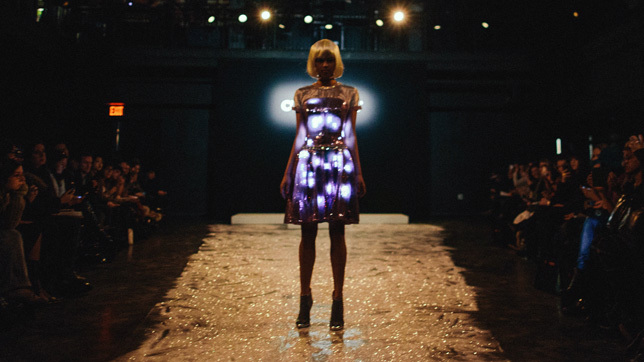 CuteCircuit, which Rosella founded together with Ryan Genz, uses this technology to create extravagant haute couture pieces for the rich and famous. In 2010, Rosella and Genz produced a glowing gown for pop singer Katy Perry, which she wore to the MET Costume Institute Gala ball. 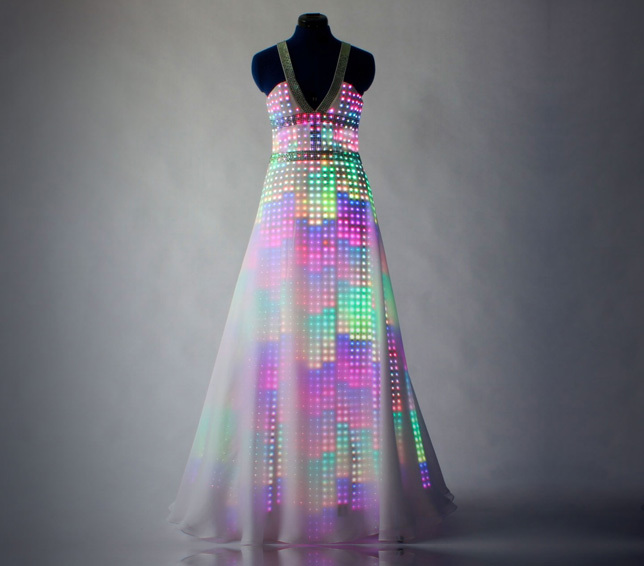 "The evening gown we designed for Katy Perry had 3,000 tiny micro LEDs," Rosella says. "We programmed it to glow very softly. She didn't feel like she was wearing technology. 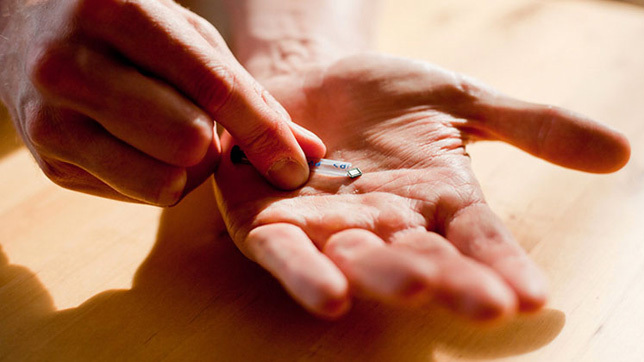 The micro LEDs we use are 1.8 x 1.8 mm and they are flat, like paper, you cannot even feel a bump on the surface of the garment." The fashion brand also produces ready-to-wear pieces. CuteCircuit's 2014/2015 collection features a range of garments that users can control with a smart phone app. "We designed a series of garments that would integrate the same components that we have on the beautiful gowns and haute couture pieces into something that is wearable and washable and can be worn by anybody," Rosella claims. 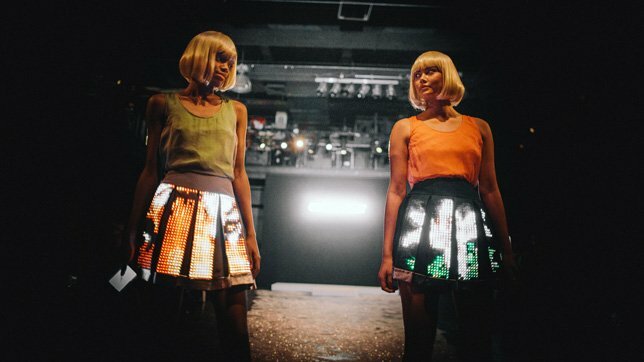 "The garments can light up and change colour in response to controls that come from a smartphone. You can connect to the garment and then change the colour or the pattern." osella believes that this digital approach to fashion can help reduce the industry's impact on the environment. "Many garments that are on the market end up in landfill," she says. "If you are able to download new content everyday or every week or every month, we will manufacture less garments." She continues: "We're thinking about the future and we want to create innovation, but at the same time we want to make sure that we're not wasting resources." Source:- dezeen.com, Photography by Benoit Florencon. A Dutch team is presenting a garment that purifies the polluted air surrounding the wearer, at this week's Beijing Design Week. 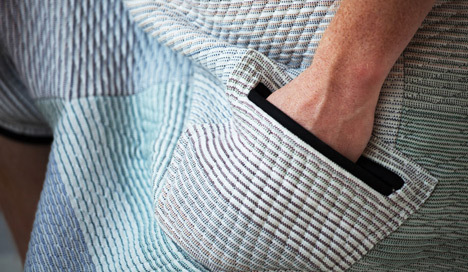 Designers Borre Akkersdijk and Eva de Laat collaborated with Martijn ten Bhomer from the Eindhoven University of Technology, Daan Spangenberg Graphics, StudioFriso and Want to create a one-piece suit that has electrical threads woven into the fabric, enabling it to provide GPS, Wi-Fi and air-cleaning technologies. "The BB.Suit started because everyone was talking about wearable technology, the bracelets, the glasses," Akkersdijk told Dezeen. "We thought about how we could really integrate the electrical threads and sensors and not just stick them on." The BB.Suit uses cold plasma technology to create a bubble of clean air around the wearer. "Cold plasma technology is a really high voltage that splits up the particles in the air," Akkersdijk explained. "It grabs the dust and then it drops, so all the bad particles in the air go down to the ground." An air-quality sensor integrated into the suit counts the particles of carbon monoxide, methane and dust around the body. 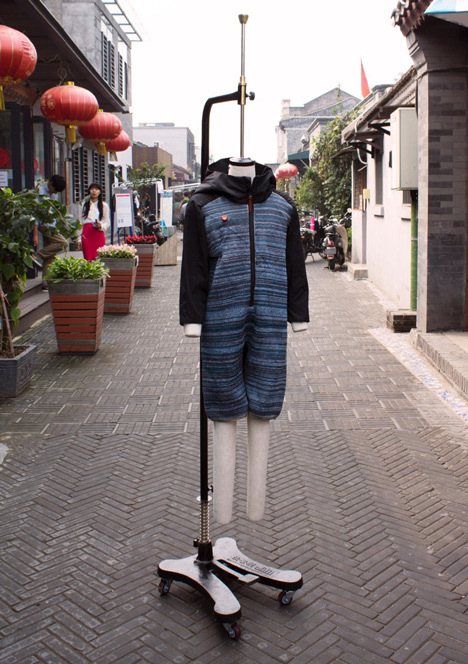 The first iteration, presented at SXSW earlier this year, featured the GPS and Wi-Fi capabilities, but the team decided to tackle a local problem when developing a garment to show at Beijing Design Week. "There's always issues about air pollution in Beijing," said Akkersdijk. The electrical yarns are woven into the body and knee-length legs of the single clothing item, which zips up the front, while the long sleeves and a hood are formed from standard textiles. The air quality sensor is located at chest level and is connected to a hidden platform chip that tracks and transmits the data. The chip is also wired to a battery and the cold plasma node on the back of the suit. 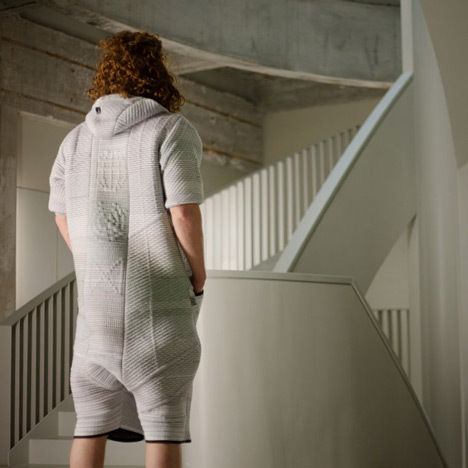 Although safe and fully functional, the garment was created as a step towards a connected wearable platform rather than a product to be marketed. "We can't currently sell the suits, because it's way too difficult to wash them, but it's the first step," Akkersdijk said. The BB.Suit is on display in the Dashilar hutong district of the Chinese capital for Beijing Design Week, which runs until 3 October. Photography is by Benoit Florencon.